Xizang Autonomous Region, also called the Tibet Autonomous Region (TAR), is a province-level autonomous region of the People's Republic of China (PRC). Its capital is Lhasa. English speakers often call this region Tibet, but Tibet can also mean any place where the Tibetan culture is local to. Tibet's main religion is Buddhism. Their traditions make it a place of interest to many people. The local monks are sometimes said to have special, superhuman abilities. The writings of Tibetan monks are sometimes shared with outsiders, and are known for their insight. The Tibetan Book of the Dead contains rituals for the dead and dying, somewhat similar to the Catholic last rites. The religious leader of Tibet's Buddhists is called the Dalai Lama. He was forced to leave the country when the Chinese Army took over. The Dalai Lama presently lives in exile in India, but often visits other countries. There were many Tibetan areas that were historically Chinese. Chinese is a demonym for people from China, which has both historically and today been made up of many tribes local to different areas of China. The largest one is Han, most large cities in eastern China are Han. There are many Tibetan Villages, Towns, and Cities in the Sichuan, Qinghai and Yunnan provinces, but the Xizang Autonomous Region was not connected to China until the 1950s when the army of the People's Republic of China took over. Tibet is divided into 2 municipalities (地级市) and five autonomous prefectures (自治州). Tibetan culture also influences other regions nearby, such as Nepal, Bhutan, parts of eastern Kashmir and some regions in northern most Republic of India, most notably Sikkim, Uttaranchal and Tawang . 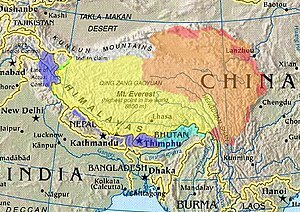 China claims part of the Indian province of Arunachal Pradesh as South Tibet. There has been some protests in Tibet since China took control in the 1950s. Most of them have been because of social or economic problems. Some of them have been because there are people who believe Tibet should not be a part of China. To show their resistance, many Tibetans set themselves on fire to put the Chinese government under pressure to become independent again. In 2011, 19 people killed themselves. A railway line, the Qingzang railway, has been built, linking China to Lhasa. Also, rising prices of food, and difficult access to higher education have angered many people. The railway line also raised fears about more migration. This situation has led to some violence against people from outside Tibet. Some of this violence occurs outside Tibet. When it comes to assigning government posts in Tibet, more Chinese seem to be assigned, and fewer Tibetans. The Chinese Government claims that if Tibet became independent again, its economy would suffer. ↑ "Journal of Religion and Film". ↑ "CATHOLIC ENCYCLOPEDIA: Extreme Unction". www.newadvent.org. ↑ "The Tibetan Book of the Dead". ↑ "'China becomes Red'". webcache.googleusercontent.com. ↑ "Tibetan Resistance (Tibet)". www.crwflags.com. ↑ LaFraniere, Sharon (5 February 2012). "3 Tibetan Herders Self-Immolate in Anti-Chinese Protest" – via NYTimes.com. ↑ Tibet, International Campaign for (22 March 2001). "Tibet activists confront Qian Qichen at State Department". ↑ Hoh, Erling; Service, Chronicle Foreign (24 February 2005). "Train heads for Tibet, carrying fears of change / Migration, tourism likely to increase". SFGate. ↑ "Ethnic unrest continues in China, International Herald Tribune, April 8,2008". ↑ "Personnel Changes in Lhasa Reveal Preference for Chinese Over Tibetans, Says TIN Report". This page was last changed on 11 February 2019, at 18:50.